Pumpkins are a long-season sort of crop, and so difficult hereabouts. Moreover, about the only reason to grow pumpkins (other than Halloween carving, for which, if you must have it, you can buy any old thing at the supermarket) is for pumpkin pie. But if you’ve not ever started from a whole pumpkin (as opposed to a store-bought can of pumpkin), you may not appreciate what a massively tedious, annoying pain in the, ah, elbow the whole process is. If—as we do—you like pumpkin pie, but can’t stand the thought of those %@$%^#@ strings in the meat, despair not: there is an answer. We know for sure that pumpkins readily grow around here—a neighbor annually has several unwanted volunteer pumpkins come up here and there in her garden (unwanted…but she lets them mature). For those looking for that easy-to-use pie pumpkin, there is a pretty obvious choice, the so-called Long Pie pumpkin. This fellow is an heirloom type, brought to its modern fame—and still recommended and sold—by a local seedsman (its interesting history is given farther down this page). The Long Pie is not a traditional-looking pumpkin: it is most commonly described as looking like an unusually large and fat zucchini. But we don’t need a Halloween carving pumpkin—we want food. Moreover, excepting those ridiculously small baseball-sized varieties, Long Pie is about as early for a pumpkin as they come (but still runs from 3 up to 6 pounds). It is also a very good keeper: it can take weeks, or even months, just to be ready (so you’ll likely have your real-pumpkin pie with Christmas dinner, rather than Thanksgiving). Frankly, we do not feel this thing is worth the time, effort, and garden space it needs; but we did the homework, so for those of you who want to grow it anyway, here’s the scoop. 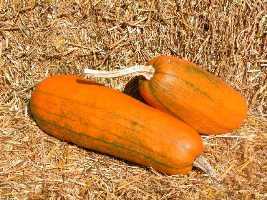 For seed savers: pumpkins and squashes require huge (half-mile) isolation from other members of the same species or they will cross-pollinate; cross-pollination will not affect the crop to be harvested, but will affect the seeds, which will likely not yield as expected if planted out the next season. Squash comprises six species—Cucurbita maxima, C. mixta, C. moschata, C. pepo, C. ficifolia, and C. foetidissima—and no member of any those species will cross with a member of another, so it’s only same-species plants that cannot co-exist in the same seed-saving home garden. Pumpkins and essentially all “summer squash” are C. pepo, so if you grow both pumpkins and any kind of ”summer squash”, don’t save the seed—it will not grow true to type. As with all heat-loving and long-season plants in this climate, one is best to start pumpkins off indoors as seedlings. When to sow is, as always with long-season heat-lovers, a crucial question. Several sources say not to transplant seedlings out till the soil temperature is reliably 70° F. The “early” Long Pie type is about 95 days to maturity (possibly a little less from transplants). A local seedsman says that winter squash planted after May may not always come to full maturity, but that using plastic mulch and row covers helps materially. All in all, we feel that a target transplant date of June 1st is about right, but with a close eye kept on the soil thermometer. That would suggest, in turn, a sowing date of about May 15th (that’s an estimated 5 days to emergence and another 7 to 10 before the seedlings are overgrowing their pots). Pumpkins are robust growers, so sow seed in 6-inch peat or cow pots. Pumpkins (like all winter squash, which is what they are) want a very warm soil for optimum germination—the actual optimum is right around 100° F.! So get the soil as warm as you can, presumably with heating mats (they will germinate at much lower temperatures, but one might as well give them their optimum start). Plant the seeds about an inch deep, being sure to set the pointed end downward. Water the soil just enough so that there’s a trace of moisture: seeds tend to rot in moist soil (though if you’re heating the soil with a pad, that’s probably a low risk). Emergence will, as noted, probably be around 5 days. Pumpkins like a rich, well-drained soil with a pH ideally between 6.5 and 6.8; they are tolerant, but heavy clay is not good for them. “Rich” means rich: add a deal of well-composted steer manure or other nitrigen-rich fertilizer to their soil when preparing it. Transplant seedlings into the garden once their first true leaves appear or when their roots begin to grow through the peat or cow pot (usually, as noted, 7 to 10 days after germination)—but, if the outdoor soil temperature is not yet reliably 70° by the time the seedlings are clamoring for planting out, it’s critical to use some sort of cloche or Wall o’Water arrangement. But even if the soil is satisfactorily warm, row-cover material is definitely wanted till it’s pollination time (that is, the flowers have appeared). Plastic mulch, set down a couple of weeks prior to your anticipated transplant date, is a definite help (how much of a help depends in good part on what kind of plastic mulch you use—the traditional black is the least helpful). Transplant with care: pumpkins are another plant that doesn’t like its roots joggled—if you’ve used peat pots, that should suffice. Normally, one spaces pumpkins 3 to 4 feet apart, as the plants have large and sprawling leaves; but in a deep-dug bed and with a smaller, early type like the Long Pie, 30 inches might well do—but, if you have space available, more wouldn’t hurt. A pumpkin plant will usually have two or three main vines, each of which can give you one good pumpkin, provided you help the plant along a bit by not letting more than one pumpkin grow on each such main vine. Don’t, though, pick off any of the later pumpkins until you are certain that the one you have chosen is going to survive. If one has swelled up well in a fairly short time, it has been pollinated and should make it. When you’re sure it’s going to make it, pick off the next-youngest pumpkin down the vine. Wait a few more days before picking the smaller-yet ones farther down the vine, so that if your first one fails you still have another coming along shortly. Pruning pumpkin vines enhances the plant’s growth. Let those main vines grow as long as possible, but trim all secondary vines (those that grow off the main vines) to about 10 feet. Pinch off all tertiary vines (those that come off secondaries) as soon as they appear. If you run out of room, vines can be trained to grow back in the direction they came from, or can be tied to a trellis or fence and so grown upward for more leaf space. As the pumpkins develop, it is wise to put something under the vines in their vicinity to raise them up a bit, so the pumpkin doesn’t pull itself off the vine with its growth. It’s also a good idea to clip off any vine growing beyond your chosen pumpkin. (To hand-pollinate, go out early in the morning and pick several newly opened male flowers. Carefully tap a male flower so that the pollen falls onto a female flower; repeat with two or three male flowers for each female. Female flowers can be identified by the fat bud under them that will later develop into the pumpkin; also, they will not have any pollen). 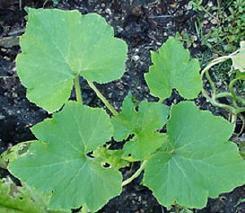 Pumpkin vines have the ability to send down more roots wherever they have a little soil around the base of the leaves. You should encourage that as much as possible, by heaping a bit of soil around the bases of as many leaves as you have time to do. The Long Pie pumpkin will still be green when the season winds down and it’s time to pick: that is normal and expected. (One source says it is ready for harvest when the small spot in actual contact with the ground has turned orange.) The Long Pie has a long storage life, and will eventaully turn full orange sometime well after it is harvested; that can be weeks, or even months (to hasten maturity, bring the ripening pumpkin into a warm area for a few weeks). Pumpkins are members of the Cucurbitaceae family, which includes all squashes as well as melons and cucumbers. The word “pumpkin” comes from the Greek pepõn, a large melon; the English called them “pumpion” or “pompion”. The term dates back to 1547, though it did not appear in print till 1647. The pumpkin is native to the New World, and was one of the many “new” foods “discovered” by the Europeans on their arrival there. Native Americans used pumpkins in many ways besides as food (as food, it was usually dried for preservation): for example, they pounded strips of pumpkin flat, dried them, and wove them into mats. The colonists quickly accepted the pumpkin into their cookery, using it as a side dish, a dessert, in soups—they even made beer out of it. The Long Pie cultivar, once known as the “Long Island Pie Pumpkin”, is an heirloom believed to have originated on the Isle of St. George in the Azores islands (from seed brought there at some time from the Americas), and to have been brought thence to Nantucket by whalers in the year 1832, whence—then known as the Nantucket Pumpkin—it was carried north to Maine. By the 1930s, it was well established in certain areas of the northeast as the pie pumpkin. (It is said that nary a Mainer ever heard of a round pumpkin unless they moved away from home.) Little by little, though, the Long Pie’s fame faded, and by the 1980s it had reached total obscurity (though the Penobscot and Abenaki tribes still regularly grew it). It was “rescued” by a cucurbit fancier who chanced on a sample, and was sent on by him to be added to the stock of a seedsman now located hereabouts. It is now once again found in seedsmen’s catalogues. If you want to brighten the lives of those around you with images of pumpkins—all in the public domain and thus free—there’s a pumpkin clip-art web page (the images are drawings, mostly cartoons and mostly of carved pumpkins). You loaded this page on Friday, 19 April 2019, at 16:21 EDT. It was last modified on Saturday, 2 February 2019, at 18:18 EST.